Personality tests may seem a bit outdated, but in today’s world, where the number of job applicants is larger than the number of openings, more and more business owners are turning to personality tests to see if potential and current employees fit their company. Personality questionnaires assess personal behavioral preferences. They are not concerned with your abilities, but how you see yourself in the way you relate to others, your approach to problems, and how you deal with feelings and emotions. There are no right or wrong answers. To customize this template, take the trial version of our Professional Plan & choose ‘personality test' as example when creating a new survey. If taken before an interview, personality tests help in narrowing the selection of candidates, as it gives an insight into the characters of all applicants and helps employers decide which respondents should be invited for an interview. With only having a limited amount of time in an interview, candidate skills and abilities can often be overlooked on a CV or face-to-face, however, a personality test offers a deeper insight into how they might fit into a company work culture. Why use Survey Anyplace for Personality Tests? Let people take the quiz on- and offline. With our offline features, you can organize personality quizzes everywhere. 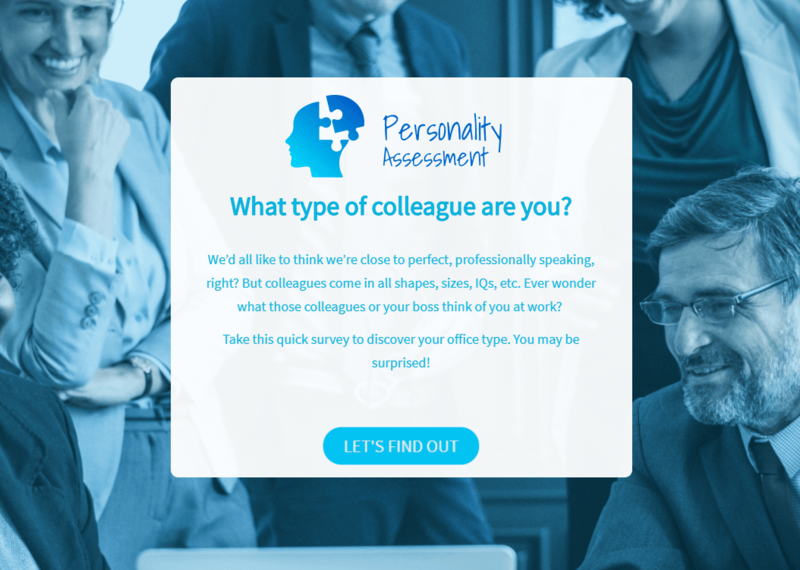 To use this personality test example, sign up for Survey Anyplace’s professional trial, and choose ‘Personality Test’ as a template when creating a new survey. The most common type of personality test questions is statement-based ones. In this type of question, you receive a list of statements and are asked to state the extent to which you agree or disagree with each statement. For example, you might receive the following statement: ‘I am confident that work accidents won’t happen to me’. You will then be asked to state the extent to which you agree with this statement on a scale of 1 to 5, where 1 is ‘strongly disagree’, and 5 is ‘strongly agree’. This type of personality test question is somewhat less common than the statement-based one. However, it is used by some multinational test developers, such as SHL. In this type of question, you receive a list of 3 or 4 adjectives or statements. You are then asked to rank them from the one that is the most like you to the one that is the least like you. For example, you might receive the following 3 adjectives: ‘friendly’, ‘careful’ and ‘responsible’. The challenge of this type of question is that sometimes all adjectives are equally desirable for the job you are applying for. Most personality test questions are not straightforward. This means that reading the questions does not always help you identify what they measure. This is done on purpose to increase their accuracy. However, in some cases, the fact that personality test questions are not straightforward has led to a misunderstanding of them and, consequently, to an ‘undesirable’ personality profile. Therefore, it is very important to prepare for your personality test.